Greetings in the name of the Lord. Blessings for all of you, my dear friends. Blessed is this hour. Every human being desires to strive for perfection, for the ability to love, and for true goodness, for light and truth. The desire lives in the divine spark of every being, but in its pure state it does not always penetrate all the layers of imperfection that surround the spark. We see it as though the sun were shining through dirty glass and the rays coming out on the other side took on hazy shades. But, dear friends, quite apart from this higher-self desire, the desire for perfection comes also from the lower self. This is so with all people who have realized that selfishness and self-serving aims do not bring many desirable results. If you were to serve only the aims of your essential lower self you would certainly not be loved and admired. Therefore, the desire for goodness is also selfish. Understand this and recognize within yourself that the desire for goodness does not necessarily and exclusively come from your higher self. This is a confusing problem for many human beings. You can gain clarity only if you become aware of your emotions, desires, and motives. Then you can separate the pure motive from the selfish one. This confusion is so strong at times that many people become uncertain whether to follow the desire for goodness, particularly after discovering the selfish motives. You should certainly continue to aim for the right and good within yourself and in your actions, but you should also be clear as to what extent your desire is colored by selfishness. This conflict is often not yet conscious. You are aware that you do want the good, the true, and the beautiful, but there is also a voice within that asks quite clearly, “Is it really pure goodness, pure unselfishness if I do such and such?” You become confused and uncertain about your own good motives. Only the very blind, those human beings who are still spiritual infants, seek selfish ends and believe that their selfishness will serve their purpose. Whoever has outgrown spiritual infancy knows very well that serving one’s own ends often brings greater disadvantage than resisting such selfish impulses. At this level, the entity has outgrown the most primitive stage, but has not yet reached the stage where the desire for selfishness has been emotionally outgrown. This is the stage most of you find yourselves in, and it is this very struggle that we are concerned with. The first step is always to recognize the meaning of your various desires, motives, and feelings. From there on, the path becomes easier. Recognize where your desire for goodness comes from your divine spark and where it does not. Once you have gained clarity, you will have not only made a further step in self-knowledge, but the recognition—even though by no means flattering or comfortable—will give you added peace of mind. The moment you fully accept the idea that selfishness still has a larger place in you than you were ready to admit before, and are willing to let go of wanting to be more perfect than you presently are, you have begun to face yourself in the true sense of the word. Coming off your high horse is healthy; and health, emotional or otherwise, must have a very good effect on you. 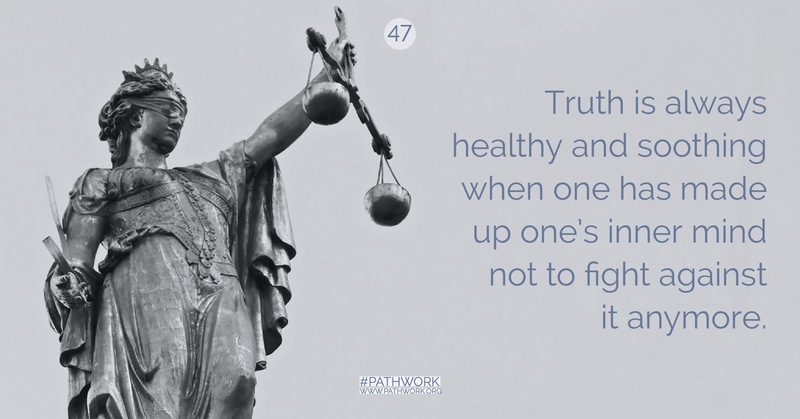 Truth is always healthy and soothing when one has made up one’s inner mind not to fight against it anymore. As the human being develops spiritually and matures emotionally, self-knowledge continues on ever deeper levels. On the most superficial level of development, “good” is done outwardly but one harbors selfish and evil thoughts quite consciously and knowingly. When confronted with such a situation there are two forms of behavior. On this path one tries in a spirit of true understanding and humility to accept oneself as one is at the moment, and also to accept one’s inability to change as yet. One has the courage to admit to oneself that perfection is still far away, in spite of the outer good deeds one performs mainly in order to conform and to gain admiration. The other alternative is to rationalize, justify, and self-righteously “explain” harboring such evil or unkind desires, while seeking self-justification in the shortcomings of others. This you would call hypocrisy. Many people fall into this category. This type of behavior is so crass and elementary that we do not have to bother with it. The case becomes infinitely more difficult when the same hypocrisy becomes subtler and more deeply buried. Good desires are superimposed on selfish ones, which are suppressed and relegated to the unconscious. This is partly due to the sincere strivings of the higher self and partly to the selfish ends of the lower self. Here begin the human conflicts that render a soul sick and weak. We are concerned, for there is no human being to whom this does not apply in one way or another. The more you keep the selfish motives suppressed, the more confusion and disorder are created within you. A basic misunderstanding exists here: you realize that the first category, the most primitive form of hypocrisy, is distasteful, therefore you suppress your true emotions, because of the wrong conclusion that there is no alternative. You make yourself unaware of the existence of wrong desires because you think that otherwise you would have to be like those hypocrites whom you do not admire for their attitude. You ignore the third alternative which is the only healthy one. This approach leads to the perfection you strive for: facing and admitting the wrong desires without giving in to them, and yet without suppressing their existence. The beginning is always the most difficult, and that is the sorting out of your emotions, finding their meaning, facing all that you have looked away from. Now what is the spiritual substance of this wall, my friends? For spiritual substance is not a material that you use because you choose it as when you build a form in your material world. You make your choice of material according to taste and necessity, but the material has nothing to do with you. Spiritual substance, on the other hand, is the product of your thinking, feeling, and being, and it is formed from them. You cannot use something you have not got. And you have only that which you are. The substance of your inner wall is partly your goodwill that is ineffective because of wrong conclusions and ignorance. Do not forget that the purpose of the wall is to keep the negative in hiding, and one of the motives of this desire is actually misapplied goodwill. But it consists also of cowardice, pride, self-will, and impatience. Your impatience mounts because in your ignorance you think and wish to attain perfection more expeditiously by simply erecting this wall and locking up what would take much more time and effort to eliminate. You are too impatient and also too lazy to really tackle what lies behind the wall. All these trends are the building materials of the wall in your soul. As one progresses on the path of self-knowledge and perfection, one slowly begins to take out certain trends and attitudes from behind the wall and transpose them into consciousness. All of you know the process by which this is done. It is the work I advocate and teach. In this process, the wall recedes. The more comes out from behind the wall, the fewer trends remain locked in. This is good work, and it needs to go on and on. But, my friends, this wall must one day disintegrate if you want to be whole and truly healthy. As long as you retain any part of the wall within yourself, no matter how much you have succeeded in making it recede, you are not yet whole. You do not function as God meant you to function. Therefore, your aim has to be to destroy the wall altogether. In most cases, this cannot be done at once and if it is hastily attempted, people can suffer breakdowns and all sorts of other complications. In many cases it is advisable to make the wall recede and to gradually lift out what is behind it. Thus the wall not only recedes, but if properly done, the substance itself weakens. Otherwise, one may succeed in taking out certain things and pushing the wall a little into the background, but there it will remain in full force—perhaps even getting stronger. I will explain in a moment how this could happen and how to ward off the danger. Let me emphasize again how important it is to be aware of the necessity of one day destroying your wall. This can and should happen without unduly shaking up the personality. Your spiritual rebirth can occur only after the wall has disappeared. Then your soul stands naked in front of your Maker, in front of yourself. For you have to become that naked, that empty so that divine substance can fill you and take root within yourself. As long as your rigid wall remains, however weak, however pushed back it may be, the divine substance is ineffective to the degree of the strength of the wall. In other words, the stronger the wall, the weaker the effect of the divine substance that is waiting to penetrate and fill you. So, my dear friends, all of you who work on this path so successfully, visualize this wall within yourselves. You can find it in meditation, you will sense it by observing your reactions, and you will then know where the wall stands. After locating it, it will be much easier for you to finally succeed in eliminating it altogether. And now I shall speak about a danger you must guard against. It is the hazard of getting off to a good start in extricating some hidden trends from behind the wall but strengthening the wall unconsciously by employing halfway measures. When and how does this happen? It happens when a true thought, teaching, philosophy or recognition serves as a camouflage behind which you continue to hide. This happens so frequently, my friends. No truth is exempt from this fate. Many people search for truth; and truth can come to you through many channels. But no matter how sincere the search is, almost everyone wants to resist facing certain things within. The two contradictory desires can coexist; one searches for the truth, and one can use these truths to reinforce the wall. So you can hide your faults, emotional conflicts, fears, and negative trends behind a truth. In its crass and superficial version this misuse of truth is easy to recognize. You recognize it in any fanatic, in anyone who adheres rigidly to dogma, in whatever religion. Such a person may commit all sorts of wrongs, have all sorts of wrong reactions, while he propounds the religious truth of his choosing. But do not forget that, in principle, the same thing goes on in almost every human being, only in a much more subtle way. And if you become sensitive, if you raise your intuition, you will hear and notice this pattern very well when one of your brothers or sisters falls into it. You will object to it, yet you will ignore that you do the same thing, only you use another truth as a shield. This may be a religious, spiritual, metaphysical truth, a philosophical truth; it may be pure ethics and morals, without any religious implications; it may be psychology, or psychoanalysis. Many theories, terms, and expressions that you use are true and as such are good. But the moment they are used in that way, they are abused and they therefore lose their validity. They become dead, rigid, and meaningless. No truth is exempt from this fate if you are not watchful, if you do not look out for this tendency in yourself. The very teachings I give you can be abused in the same way. It is never done on purpose, of course, but unknowingly. Perhaps all this sounds strange to you and you may still not grasp what I mean. Let me try to make it a little clearer. Let us assume you have started on this path with good faith and goodwill and you have progressed well. You have made certain major recognitions. You have passed the stage when your resistance to face yourself manifested in finding excuses and rationalizations for not going on such a path, in spite of your search for it. Thus you have broken the first resistance and pushed the wall considerably into the background, allowing certain information to filter through. At this point you are well launched on the path itself, while previously you were only struggling to get on it. But do not imagine that then all resistance is overcome for good. For as long as you maintain the wall, resistance is inevitable, and only the form and manifestation of the resistance will be different. While before you had all sorts of doubts, misgivings, excuses, and pretexts about entering this path, you now work and discover, but still with some reservations. And in order to justify this reservation, you now take the findings you have made so far and build them up. You may even let them grow to disproportionate significance to prevent yourself from penetrating deeper. You use the same words again and again until they become rigid and no longer carry the living life-force. Any truth must do just that. If it no longer does, if the words have become automatic, then the time has come to examine yourself from this point of view and find your wall again. Once you are aware of it, you can wage a healthy battle with your ignorance and resistance. Only you yourself can find out when and how you are hiding behind your wall, and what truth you are misusing. Only by examining your feelings, by listening into your emotions can you get the answer. The fact that you have overcome the initial resistance and won your first victory is, in most cases at least, a milestone indicating that you will not leave this path again. But this does not mean that other resistances do not lie in wait, that other victories do not have to be won. Although you may never leave this path, you may get stuck at a certain point and go around in circles without penetrating deeper. This happens when truth and true findings are used as hideouts. The unconscious is congenitally opposed to giving up its subterfuges. It considers coming out into the open a grave danger. It is ignorant and draws utterly erroneous conclusions in this respect, as in many others. Therefore it is opposed to let the wall crumble and concocts all sorts of ruses to prevent you from working in this direction, no matter how good your intentions may be. This should be a warning for you to show you what the danger point may be at this time, in what direction to look within yourselves, so as to gain further victories and penetrate deeper into your souls. Now you will know from what angle to approach yourselves to avoid stagnation. Is this clear, my friends? Think well about what I have said. I pointed out a hidden danger, a subtle danger. If you are truly desirous of making the wall crumble, to become empty and naked in your soul, then you will feel quite clearly where and in exactly what way your own wall exists. It is always easier to notice it in the other person, but one is utterly unaware about it in oneself. You may hide behind a different truth, behind a different recognition, yet you also may hide just as much as the other person. Take your intent into your prayers, my friends. Ask God to help you first to see the wall and then give you the courage and the humility to break it down. And now, before we turn to your questions, I should like to tell you that a plan has materialized for a second smaller group to be formed, similar to the first so-called inner circle. We would recommend this very much. In such common group work you can accomplish much. You can help one another. Everyone of you who is working in image-finding teams should get into additional group work where you can discuss your problems, difficulties, and successes. At the same time, it will help many to form a bond. We encourage and we bless this undertaking. And now, my dear friends, I am ready for your questions. QUESTION: Are currents, as you use the expression psychologically, used by the unconscious or conscious mind as an instrument? In other words, is the unconscious or conscious mind an instrument, or are they connected or identical? ANSWER: We cannot say it is either way. A current is actually a result of your feelings, your thoughts, emotions, attitudes. It is the sum total of your conscious and unconscious trends and traits. It is that which governs you and brings your life and that which happens to you into certain channels. Let us take the current of self-will. It is there. You use it, whether consciously or unconsciously makes no difference. The using of the self-will generates a current, and the current has an effect. The current of self-will is not the self-will itself. It is the self-will at work. Self-will could be dormant, it could be unused. Then the current would be weak, or so hidden in its effects that the personality would never know what causes the effects. But if it is used, even in the unconscious, even if it does not manifest as such, even if it manifests in a very roundabout and hidden way, the manifestation of it is caused by the current. Imagine it as something like electricity. Certain conditions are necessary to produce electric current. It is exactly the same thing. The electric current is a result of the conditions that can bring it forth. Is that clear? QUESTION: But the conscious or unconscious mind then would be an instrument or storehouse? ANSWER: Well, a storehouse is not the same as an instrument. It is the mind that produces it, the unconscious or the conscious mind. You can say that it is the personality, made up of the conscious and the unconscious mind, that produces it. Therefore it is not the instrument. An instrument is something passive. But the mind actively produces currents. QUESTION: Where does a “must” end and a duty start? How do you distinguish between the two? ANSWER: The “must” or the compulsion is always a result of untruthful, mixed, and confused motives. Duty is something entirely voluntary. If you fulfill a duty without compulsion, you do so because you decided it. It may be something that life seems to force upon you. But once you recognize that you cannot live life entirely as you would choose, that life brings situations and predicaments which one has to accept, whether one likes them or not, the healthy attitude is to say yes to life as it is. Then you voluntarily accept a duty. If you do not accept it emotionally and do the duty because you have no other choice, you are acting under a compulsion, against your will, and then it is a “must.” I have taught you, for instance, that life’s imperfections have to be accepted in that spirit. This includes also things that become your duty. He who constantly rebels against these imperfect conditions even though the rebellion may be quite unconscious, acts against his will, like a child who is forced to obey. The mature attitude is the free one. This real kind of freedom does not mean that one can always do exactly as one pleases, but that one accepts the necessary with a willing spirit, with an inward “yes.” In other words, the borderline is in the very fine distinction between saying yes to an imposed or inevitable duty, or struggling against it and being forced to accept it against one’s will. The difference lies in your attitude. QUESTION: What is the connection and the difference between the aura of a person and his present sphere—or the soul picture? ANSWER: These are entirely different things. One has nothing to do with the other. The sphere is built up by the person’s deeds, thoughts, attitudes and feelings. It does not change quickly, because change in the personality cannot come about quickly. Therefore, the sphere is more static and will remain until the personality changes. It is the product of one’s life and will afterward become the entity’s spiritual home. The aura is the emanation of the personality and has nothing directly to do with what you build. Perhaps we can best explain it this way: The sphere is the result of your activity. The activity may also be an unconscious one. It is the activity of your soul. The aura is the product of your passive state. It is the product of that in you which is the state of being. It is what you are, not what you do. That is the best way I can explain it. I have no other words. And as far as manifestation is concerned, the difference is strong. A clairvoyant can see a person’s aura, that which emanates from the subtle bodies and penetrates the physical body. It reflects, in fluctuating colors, various moods, diseases of body and soul, the basic character type that you are. The spiritual sphere you build with your activity can be seen by very few clairvoyants, unless they are given such sight with our help for a specific purpose. It is something that not every human being carries about. I cannot express it in any other way. I know it is difficult to understand, but you will have to make the best of my words. QUESTION: In connection with your lecture on authority, could you give any further advice to a person who finds that with a particular form of authority he is unconsciously a law-upholder, but consciously he is a definite law-breaker to the point of acute resentment, dislike, and intolerance toward this particular authority? When you finally succeed in answering these questions by learning to make your emotions conscious and articulate, you will understand deeper layers of your being that are responsible for the reactions you have recently discovered. But they are not yet the final answers. They only lead to them. Make constant and detached observations of your daily reactions. Find your attitude toward them, and learn from them to find what lies behind them. This in itself is already a curing agent to a large degree. Furthermore, by doing all this without haste, without tension, but with steady perseverance, you will see all the wrong conclusions that are connected with such attitudes. The important thing is then to think these conclusions through, to see why and how they are wrong, and what the right conclusion would be. Cultivate this process of questioning and observe how the emotions—which work slower than the brain mechanism—still adhere to their old patterns. Then these emotions will begin to change gradually, at first almost imperceptibly. This is the only way, my friends. In this connection, I would like to mention something I have recently said in a private session because I deem it important enough for all of you. Authority is not only that which emotionally represents the enemy, the restricting forces that prohibit your doing what you wish. Authority can also be represented for you personally by the very people you love most, because you are dependent on them. Most of you go through this in childhood. After childhood this situation may repeat itself for the adult in a somewhat different version. You love your parents, and yet they are your authority. The conflict came into existence because you loved them. You may wonder how to solve the problem which is that you cannot help feeling dependent on the one you love, and therefore this person becomes your authority. The answer to this question is: Examine your love and find the right middle path. One extreme is the inability to give up the self and therefore the inability to love at all; also too strong a fear and self-will, which prevent you from letting go of the self. The other extreme is an overdependency that arises from the tendency to let go too much in the wrong direction. Wherever such lack of balance exists, other unhealthy and harmful currents prevail, and the balance has to be established by becoming aware of the problem and looking at it squarely until you recognize either of these two wrong extremes. The more frequent tendency is to not give up the self at all. Look at it again and again. Merely acknowledge it, and pray for guidance and recognition. Then, gradually, your emotions will find the right middle way. The person for whom the loved one becomes the authority because of an overdependency will learn that though in a healthy and true love one does give oneself up entirely, but one retains the self in a new way that does not keep the personality unfree and dependent. You must get yourself back renewed and freer than ever by letting go of yourself entirely. The fear of giving up the self is a very common failing, it is a frequent cause of sickness. But there are also cases where the opposite extreme exists. Yet the opposites are now more similar and nearer to one another than you may think. The true giving up will choose the right way and the right circumstances where no abuse is ever possible, where the other’s maturity meets one’s own maturity. The immature person will blindly choose the object that may take advantage of the giving up the self. And the fear of this creates the extreme of prohibiting the self from giving itself up at all. Maturity is conscious understanding, which, in turn, raises the intuitive powers that will make the right choice where no one takes undue advantage. QUESTION: How does the spirit world judge a person who is searching for truth, yet escapes from himself and chooses the easy way out? ANSWER: That depends entirely on the development of the person in question. The same is not expected of everyone. There are people who merely try to live right and to not commit crimes, who live an average, decent life. For them this is the most that can be expected. It requires all of their effort to do just that. It is all they are capable of in this incarnation. Such a person finds more fulfillment than one who goes on the path only half-heartedly and stops midway. The latter may not be doing his or her best. You human beings are always inclined to judge everyone alike. We cannot do so because everyone is of a different spiritual age. Everyone has reached a different stage of development in different respects of his or her personality. There are different basic factors to be considered. The characteristics, the strengths, and the tasks are different, according to former incarnations. If, for instance, someone capable of searching and facing the self gives up because of laziness, pride, or for whatever reasons that follow the line of least resistance, the result must be felt by the entity. We in the spirit world do not judge in a moralizing way; we do not punish. All that is wrong. There is no such thing. You punish yourself. If you go against your own plan, if you do not do what you set out to do when you came into this life, you draw circumstance toward you that will finally corner you and this is for your own good. You can observe this with some people. Life corners them, not because God punishes them, but because they have set certain forms in motion that oppose their life plan. When the life plan is violated, the life plan itself begins to work so as to bring about fulfillment. If the choice of the personality is directed against it, the life plan must work differently than if the person had adhered to it. But the result must always be the same. The experiences and the time element will certainly be different. But the end result must be the same. For the life plan works to establish balance and harmony. The more ignorantly the personality works against the balance and harmony, the more disharmonious the process of establishing balance and harmony must be, but come it must in the end. Such is the healing force of nature. The same healing force works in the elements, in the body, as well as in the soul. Whenever something seeks to bring the universal forces out of balance, the healing forces of nature step in to bring back the balance. But this very balancing out may often seem like an upheaval. In the soul, when you go against your plan, exactly the same kind of outbreak takes place as in a thunderstorm or an earthquake. But in the end the balance is reestablished. For nothing else can make you see and reconsider the direction you have taken except the apparent upheavals of your own making that are the medicine of nature. For a long time you may delude yourself into believing that all the mishaps in your life are due to injustice, to malice, and to the faults of others. But there is a limit as to how long you can go on believing that. Eventually the situation must arise when you are cornered in your own errors, when you are confronted with the undeniable fact that you yourself have produced the misery, and that will wake you up and make you change your course. That is the way we view it. We know this benevolent healing law as it simply exists in the universe. And when we see a human being we know at once by the forms in the soul, by the pictures within, whether he or she is going entirely according to the soul’s plan, or partly so, deviating a little bit but not enough to lose course entirely, or whether entirely away from his or her own road and thus producing and slowly building up the conditions that finally appear like tragedy but that are nothing but the creation of nature’s healing forces. My dearest friends, I am allowed to bring blessings to all of you and to your dear ones, here on earth as well as in the spirit world: blessings of healing, blessings of love, strength and courage. Go on this path, my dear ones. And those of you who have not yet found the way, pray that God show you His will and His truth which is the only truth. Open yourself to be receptive for this truth only. Go in peace, my dearest ones, receive our love which envelops every one of you. And if you send out your inner feelers, you will all know that you are not alone. Be in God!